Sartorius Stedim Biotech is launching a new, scalable range of single-use bags. According to the company its Flexsafe family allows single-use bioprocessing over the entire range of drug manufacture, from process development to production, both upstream and downstream. 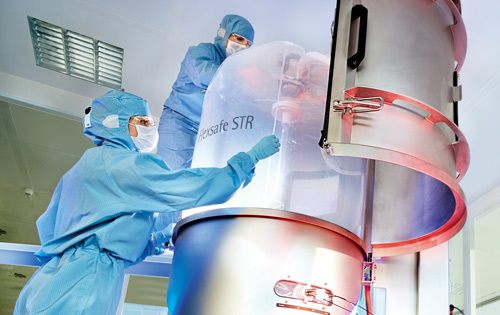 Flexsafe addresses key industry requirements for future-proof single-use manufacturing of commercial vaccines and drugs, explains a company spokesperson. Flexsafe is based on a multilayer, proprietary 400 μm thick polyethylene (PE) film called S80, developed in collaboration with resin and film suppliers. A standardized cell growth assay has been used to optimize film formulation, determine the operating ranges for extrusion, welding, and gamma-irradiation processes, and to establish specifications and process controls. Flexsafe allows for reproducible cell growth behavior of the most sensitive cell lines, maintains Stefan Schlack, senior vp of marketing and product management. The optimization of the resin formulation, the complete control of raw materials, the extrusion process and the bag assembly were designed to ensure lot-to-lot consistent cell growth performance. Sartorius Stedim Biotech is launching Flexsafe RM bags (1 L–200 L) and small bags for validation purposes first. Bags for single use bioreactors BIOSTAT STR (50–2,000 L) and additional applications such as storage, mixing, shipping freeze. and thaw will be rolled out step by step.